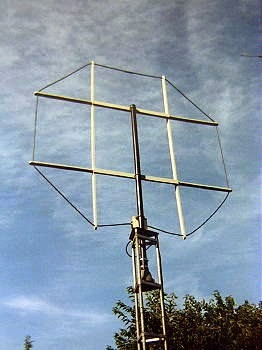 Probably the most-often discussed ham radio topic is that of 'antennas' and with LFers it is no different. you might be surprised to learn that even small, simple antennas, can be very effective on 630m. Small loops are easy to build and work well as they are often quieter than wire antennas and with preampflication, will usually yield a better signal-to-noise ratio. The shielded Burhan's loop described here, is a good performer on 630m and below, while a tuned wire loop can be just as effective if resonated to 630m. Easily built active antennas are also popular and once situated in a quiet spot in your backyard, can work extremely well, considering their size and simplicity. The PAØRDT active antenna is popular worldwide and offers good performance, if properly placed, as shown in this LF bandscan from Japan. Several of the stations that I recently worked on crossband, from 630m to HF, were using their normal HF dipoles to listen on 630m. Often times a non-resonant antenna, such as an 80m dipole, can give reasonably quiet performance and is worth trying should you just want to listen. Others have used HF dipoles with the feedline shorted and fed as a top-loaded vertical (T), and resonated to 630m against a small radial ground. Try what you presently have and you may be surprised at what you can hear. Transmitting antennas need not be large to enjoy 630m propagation. 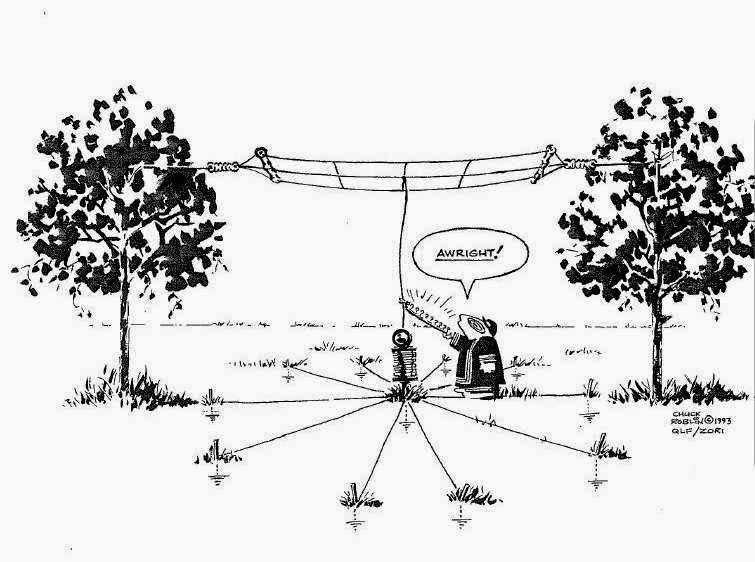 For most backyards, an inverted 'L' antenna would probably be the easiest to configure. If you have a tower, the vertical portion of the 'L' could be hung from a support arm off of the tower, with the horizontal portion as long and as high as possible. 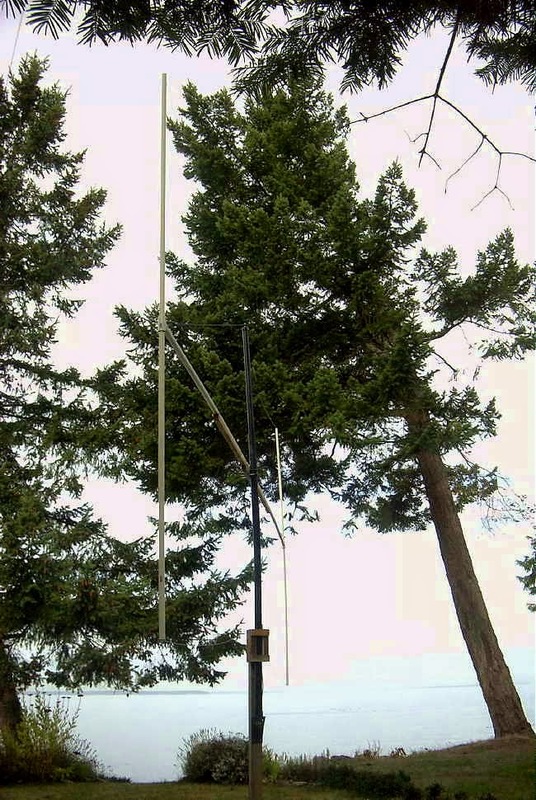 If you have some trees to hang wires from, a center-fed 'T' antenna would also be effective. In both of these examples, try and get as much 'vertical' as possible and then work on the top-hat portion. Top-hats with multiple wires will also increase antenna efficiency. An interesting paper by VK2DX, explains the process that he used to build and match a simple inverted 'L'. As well, JUMA publishes an informative application note on building an 'L' for 630m. If you don't have room for one of these types of antennas, effective results can also be had with short top-loaded radiators as used at many NDB installations. Try to go as high as you can and make the top-hat as large as possible. 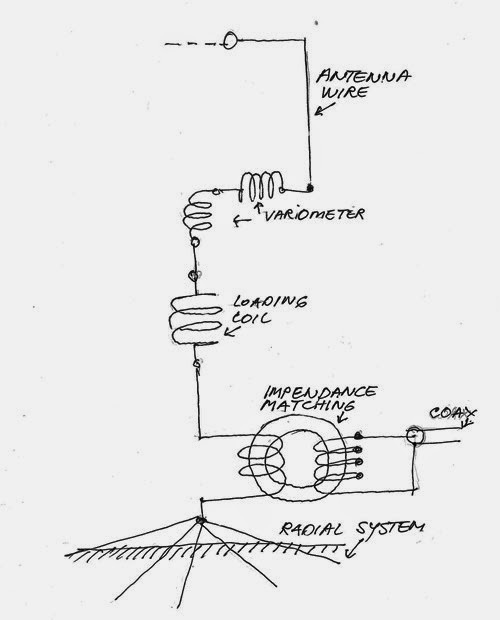 Any of the transmitting antennas described above will require sufficient series inductance (base loading usually) to bring them to resonance as well as some form of variometer to fine-tune exactly. As well, they all require some form of ground system to radiate. Since most backyards will never be large enough for an efficient ground system on 160m, let alone on 630m, just do the best that you can. You might be surprised at the results achieved with just a simple system of a few buried radials but the more you can lay down, the better. Radials can be effectively hidden beneath the grass with a few days of effort. 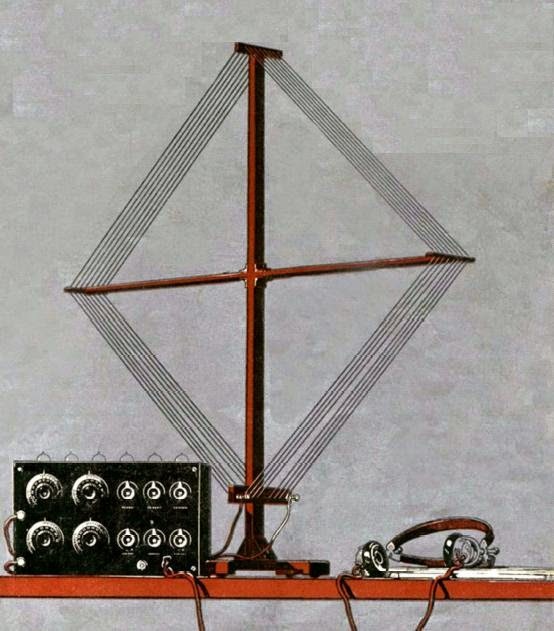 Some have noted an increase in antenna current when ground rods were driven in at the far end of the radials. This well-written series of articles describing simple antenna systems for the 1750m band is chalk-full of neat ideas and practical information...all applicable to the 630m band. For an even more in-depth look at practical LF and MF antennas, the ON7YD site is hard to beat...again, all applicable to 630m. 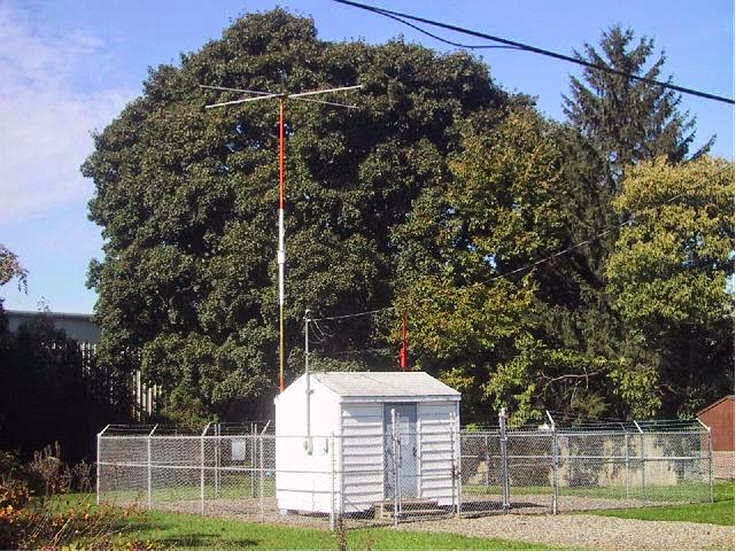 Canada's new 630m band is a wonderful opportunity to build and experiment with all aspects of your station and it's crying out for activity! It's still not too late to be the first station on 630m from most parts of Canada and the VE7's are waiting to work you! As is usually the case, conditions deteriorated rapidly as the CLE weekend approached. 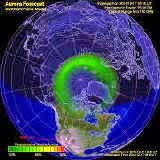 Conditions varied throughout North America as those listening from the south-eastern regions of the U.S. reported much better propagation than those further to the northwest. Friday night appeared to be the best of the lot but all three nights were very much less than stellar. The three-night event produced a total of 39 NDBs, with a couple of surprises. This particular frequency range (370-384.9kHz) is a tough one for me, since my local pest signal, 'AP' is on 378kHz, smack in the middle of the listening range. 'AP's antenna is just .4 miles (2100') from my antenna and its signal is about 60db over S9.... Very loud! The new 10' x 20' rotatable loop continues to work well. When pointed towards the east, it offers significant nulling of AP's signal and when carefully aligned to the deepest null-point, reduces the signal by almost 30db...but still leaves a very strong signal. Using this 'deep null' position, I was (somewhat surprisingly) able to log another Canadian NDB (ZFA Mayo Airprt, Yukon Territory) on the same frequency as AP. The ident-tone modulation frequencies are separated by 10Hz (408Hz vs 418Hz) which was enough to allow the very narrow ~3Hz Perseus filtering, combined with two notch filters, to reveal the 'ZFA' identifier between the 'AP' identifier. Listen for the weak 'ZFA' ident after the loud keying artifacts of 'AP', when they are transmitting just a steady tone. 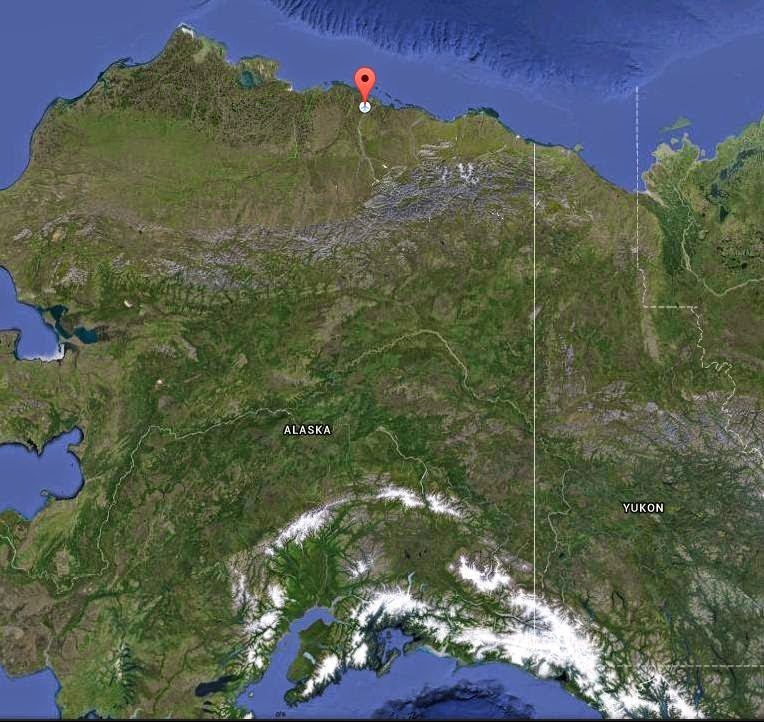 The other surprise was the logging of 'PVQ' in Deadhorse, Alaska, way up on the extreme northern slope oil fields. CLE organizer, Brian Keyte (G3SIA), reports 51 participants worldwide and over 2100 reception reports. All reports have been added to the RNA/REU beacon database. As well, Brian will be publishing all results on the NDB Information page shortly. All-in-all CLE188 was another enjoyable event....hopefully conditions will be better by this time next month and if you did not participate, maybe you will give it a try next time! 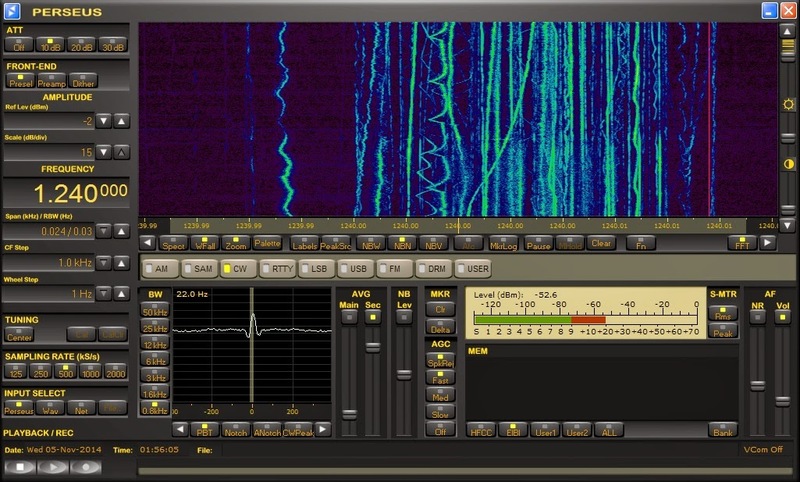 Using the transverter approach offers the advantage of providing a higher-stability signal generated by the main station's transceiver oscillator system. Most of the digital modes require a higher stability than would be needed for straight CW. 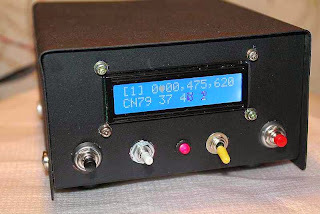 If your main interest is normal speed CW, then a digital VFO, such as the one devised by GW3UEP, would do the job. 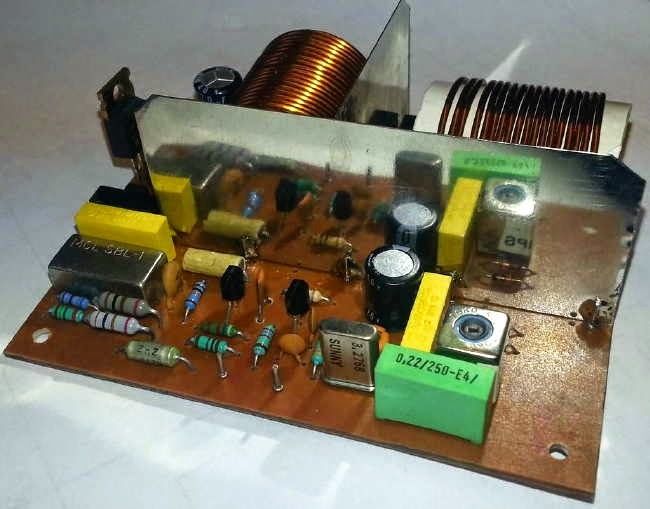 If you are content operating on 475.0 kHz, then an inexpensive 7.6MHz crystal, in a divided-down oscillator will work well, and with good enough stability for some QRSS work as my earlier "GW3UEP Transmitter In QRSS Mode" report indicated. The other option for frequency generation is a DDS. For several years now, I have used an inexpensive N3ZI DDS to drive my 2200m transmitter and, more recently, my 630m system. 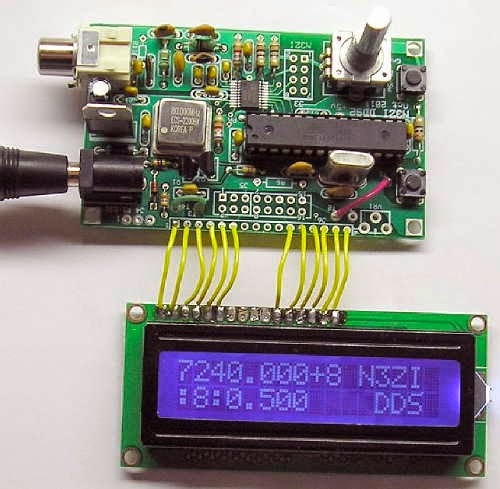 The N3ZI DDS is an affordable option should you decide on a non-transverter style of transmitter. 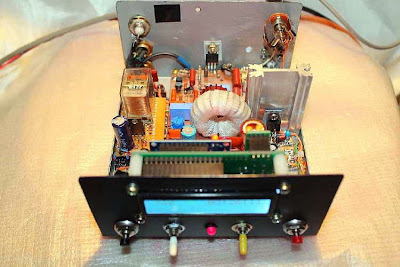 For those wanting something a bit more robust, W1VD describes a very nice high-power transmitter. His website is packed with useful circuits and ideas for both 2200m and 630m. Another practical way of generating moderate power, certainly enough to meet the Canadian 5W EIRP limit, is to combine two or more 100W transmitters, such as the GW3UEP transmitter. It is reasonably simple and inexpensive to combine several modules with the use of a homebrew power combiner, as previously described. Of course, none of this would be of any use without thinking about suitable 630m antennas...ones that will fit in your backyard! If you're thinking about getting something going for our new 630m band, the following web resources may be of help to you. There are a couple of 630m transmitters available on the commercial market that I know of. JUMA , in Finland, offers the TX500, an extremely well engineered 60W Class D CW transmitter in kit form. From Australia, VK3XDK offers the LF/HF TransverterV2, a linear mode transmitter. Available in prebuilt form only, the transmitter claims 12W output when supplied with 13.8VDC. Various IF's are available. 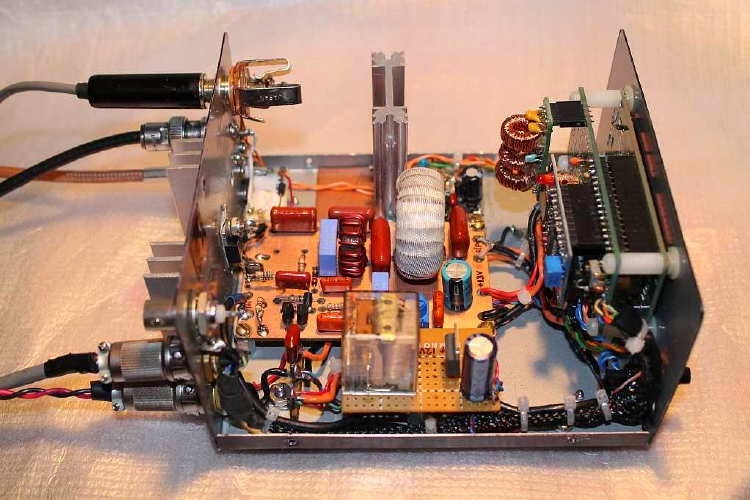 The transmitter uses SMT construction and is well-documented on the VK3XDK website. 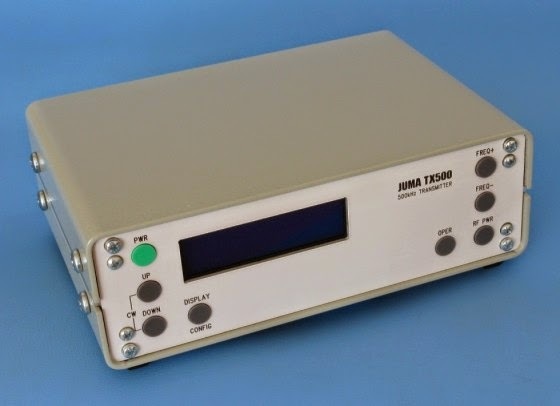 From the U.S.A., WA3ETD offers a Class D transverter (non-linear) in either prebuilt or kit form. 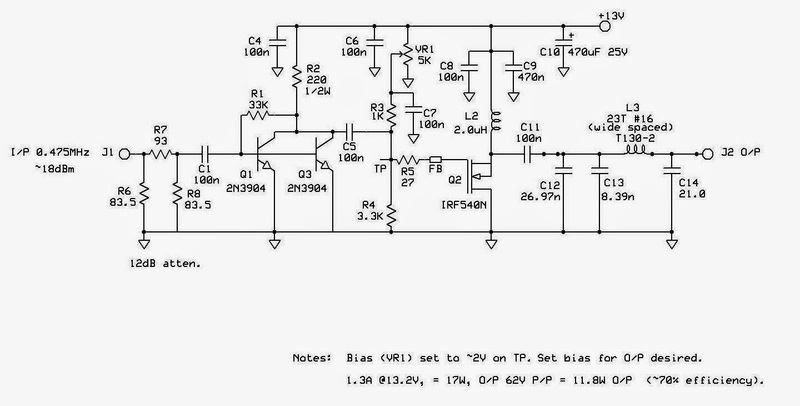 At 13.2VDC, an output of 19-22W is claimed from the single FET final amplifier. Full details can be viewed here. For the homebrewer, the new band presents many possibilities. Two of the most popular designs are the G3XBM 472kHz transverter and the GW3UEP Class-E CW transmitter. 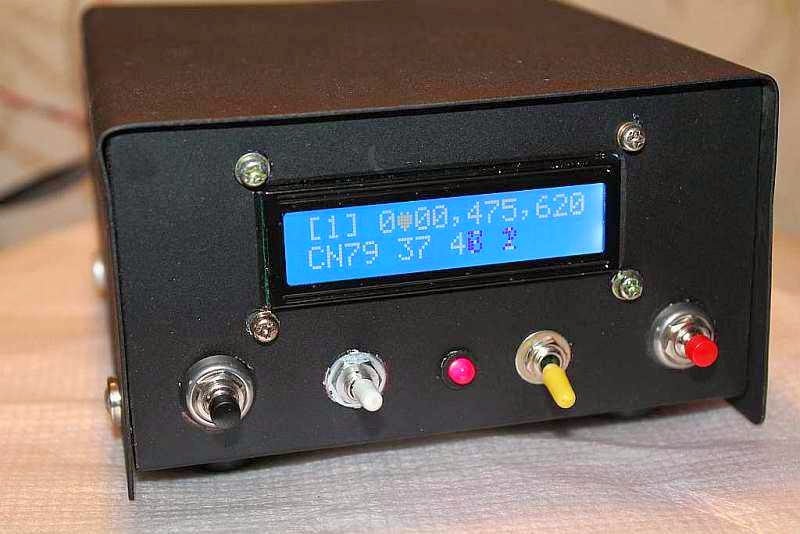 Roger's (G3XBM) has been widely reproduced in the UK and makes a nice way to get on the band on CW or with WSPR. 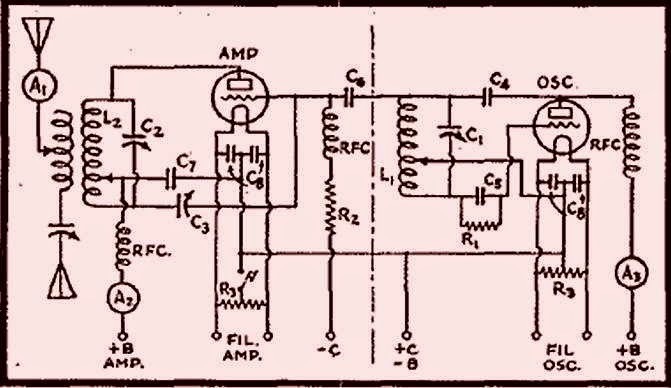 Although the final amplifier is non-linear, with a little experimentation, it could be put into a linear mode for PSK or the JT modes. 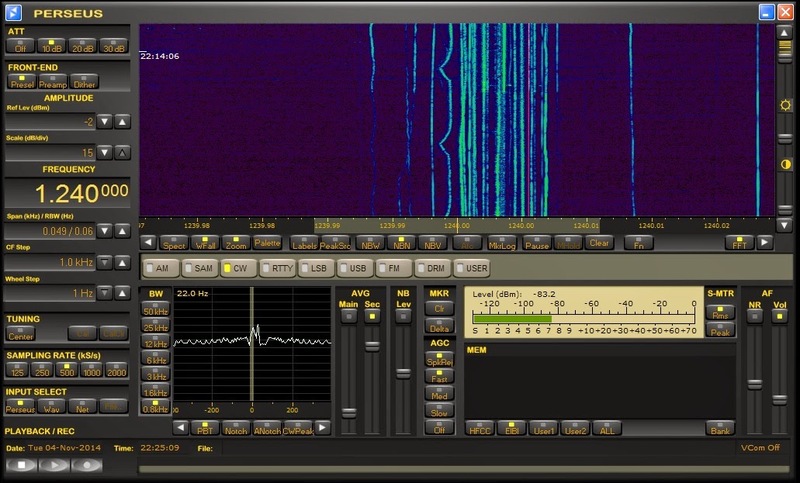 Perhaps that is what M1GEO did, as his video shows the transverter being used on SSB. The other fine design is that of GW3UEP (Rog) and has been widely reproduced with good results. My own experience with this design was described here in an earlier blog. Here is EIØCF's version of Rog's design. And...once again it's time for the monthly Co-ordinted Listening Event (CLE) for NDB hunters....the 188th event. These always interesting and popular affairs take place over three nights, with this one starting on Friday, November 21st at local noon and running until Monday, November 24th, local noon. The CLE Survey results are so interesting I almost forgot to send this! this Friday. All are very welcome - 'Regulars' and 'First-Timers' alike. CLEs are not contests - if you enjoy taking part you are a winner! (not in an attachment) with CLE188 at the start of its title. # The date (e.g. 2014-11-21, etc., or just 21) and UTC. Location and Distance go LATER in the same line. I hope the combined results will be completed on that day. Reports may be sent to the ndblist or e-mailed to either myself or CLE co- ordinator, Brian Keyte (G3SIA). Please...don't be shy and do give the CLE a try....then let us know what NDB's can be heard from your location! Your report can then be added to the worldwide database. 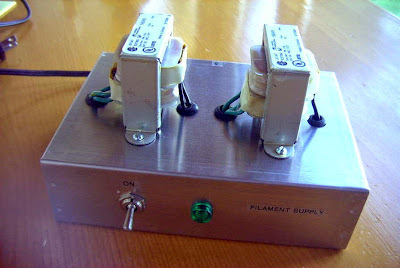 My recent 'Building For The BK' blogs have tempted at least one ardent homebrewer, John (VE7BDQ), to dig into his junkbox stash to create a nicely-working BK rig....it's a Colpitts oscillator using a pair of 45's in push-pull. His lash-up is now working and ready to go on both 80 and 40m and he is contemplating 160m operation with it as well....very nice! John and I had a nice QSO today on 80m CW and the rig sounds just great. He reports 240 volts on the plates and a current of 58ma. His scope-measured output is just over 8 watts for an impressive efficiency of just over 60%. 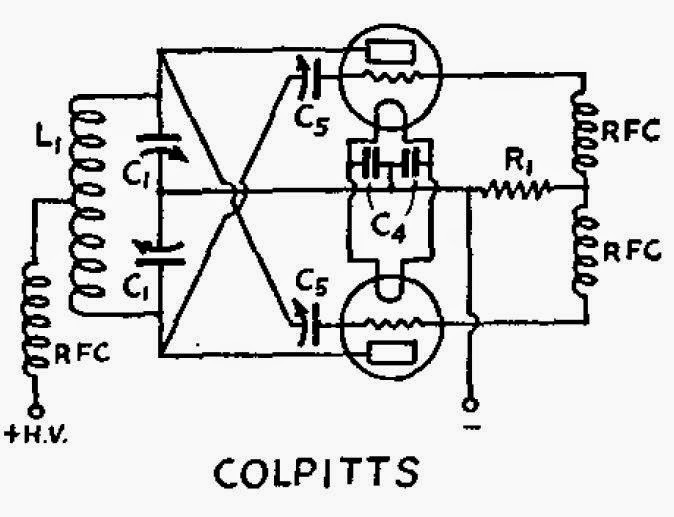 It appears that the Colpitts-style is much more efficient than the more popular TNT or Hartley oscillators...well at least more efficient than the ones I built! Although John did not have every period-appropriate component available to him, it didn't discourage him from building his BK rig. For too many, this is often a stumbling block that leads to nothing being built....as the boy's of '29 no doubt would have done, he put something together completely from his junkbox. 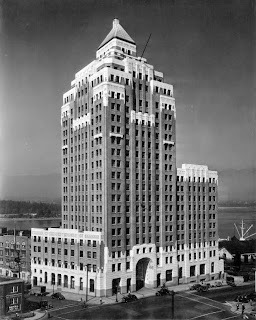 It will be super to have another left-coast station in this years '29 Party...and a Canadian station to boot! Anyone else building for the BK? ....there's still a few weeks left. The year's premier operating event for '29-style transmitters (well pretty much the only one) is fast approaching. The Bruce Kelley QSO Party runs during the first two weekends of December and hopefully catches some good early winter conditions. In a preemptive attempt at eliminating my normal (and usually justified) pre-contest wind-angst, I have begun work on a small '29-style amplifier for my Hull Hartley oscillator. Every year as contest time approaches, I anxiously follow our local weather patterns in hope that the winds remain quiet for the event. For the past few years, the wind has been non-existent...right until zero-hour, when, almost as if a switch were thrown, the wind ramps up to gale-like conditions. Now if you've never heard a self-excited oscillator directly connected to a wind-blown antenna, then be sure to take a listen to this year's BK. These '29 rigs are often not very pretty-sounding, even into a dummy load, but couple them to the wind and things get very 'nostalgic-sounding' quickly. Frequency shifts in the order of several hundred Hertz between letters are not uncommon, making copying a weak signal difficult and almost impossible if listening with a narrow filter. 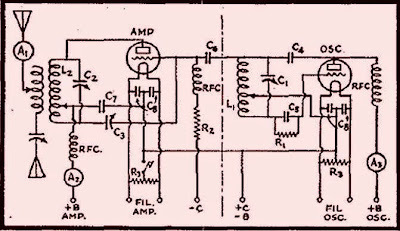 The amplifier will effectively isolate the effects of a shifting antenna impedance from the oscillator stage, making life very much less stressful, come BK time. 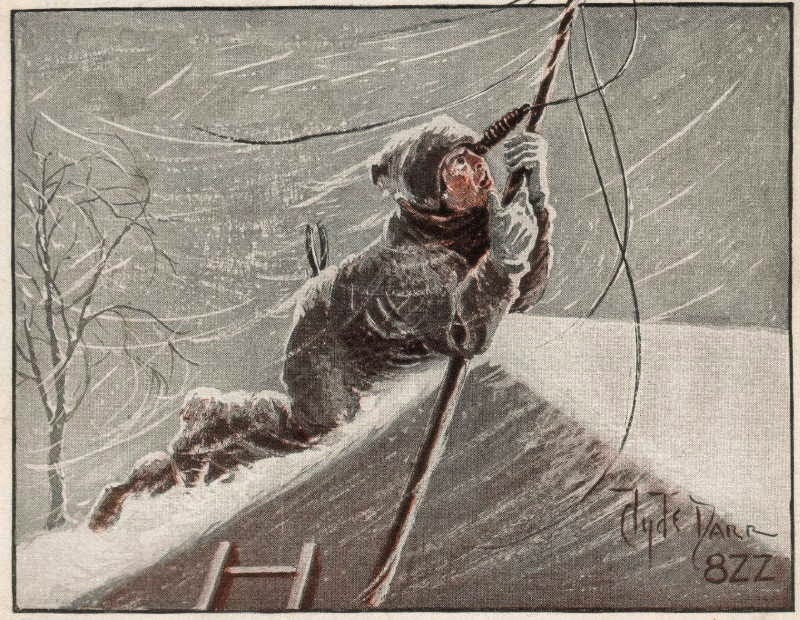 My plan is to follow the wisdom of the '29ers themselves, carefully explained in "More Power With Better Frequency Stability" by George Grammer and published in the February 1931 edition of QST. I'm always impressed at how quickly those folks back in the 20's figured out so many of the important "basics of radio" that have withstood the test of time. It must have been an exciting time to be a ham! A glance through any of the numerous radio magazines from the late 20's and early 30's reveals a vibrant market for the homebrewer, with every type of component available. Whether the average ham could afford to buy them in the hungry-thirties is another question. 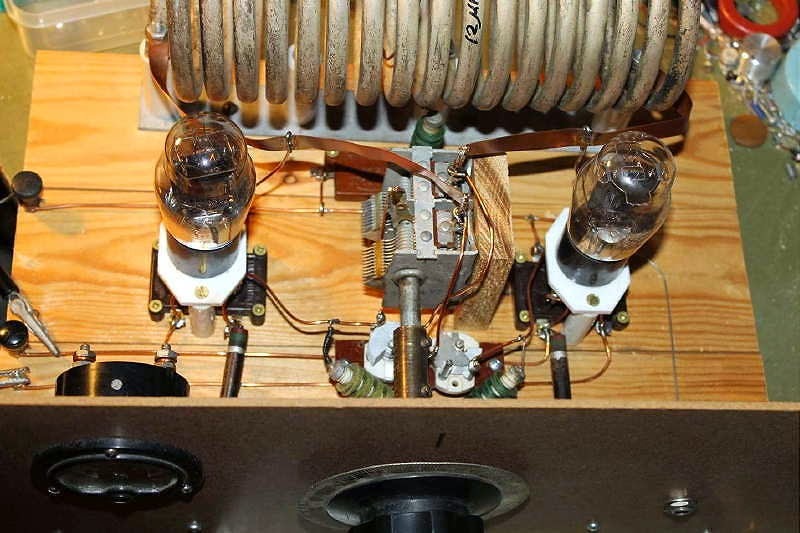 I've chosen to use another type '10' power triode as my amplifier, as shown below. 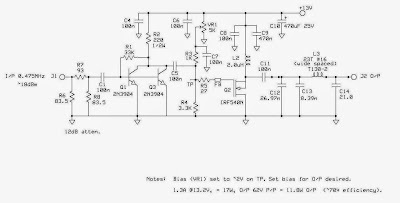 I see the main challenges being coupling conveniently from the oscillator as well as neutralizing the triode amplifier...I wonder, will neutralizing it on 40m (for example) also make it stable on 80m? As well, since the type '10' uses a directly-heated cathode, if I wish to let the oscillator run while I key the amplifier, a separate filament supply will be required for each tube. With this in mind, I've got the ball rolling this week with the construction of a dedicated '29 rig filament supply. The supply uses two center-tapped 5V transformers with their secondaries in series and brought out to the back panel. This will allow me to use tubes with 2.5V, 5V, 7.5V and 10V filaments...up to 3A. 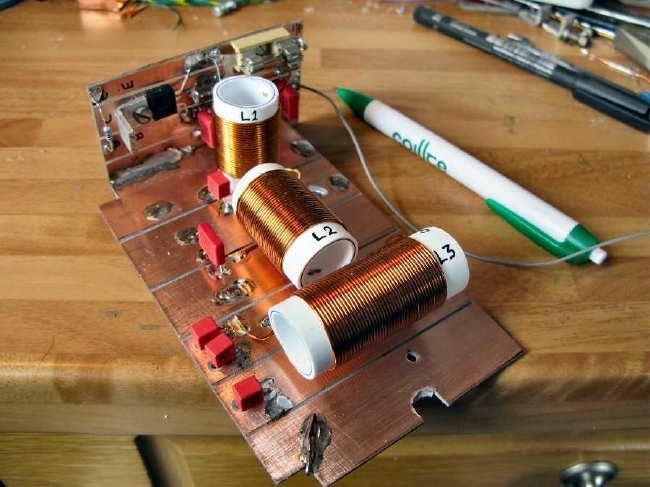 The amplifier will be breadboarded, likely with mainly newer parts, to shake-out the circuit and see how it performs during this year's BK event. 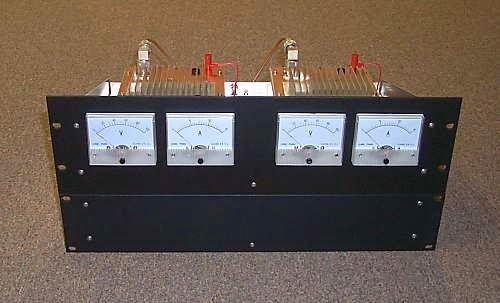 If things go well, I plan to rebuild the amplifier using '29-style components and physical layout...maybe a vertical panel that the Hartley can slide into. Hopefully I'll get the breadboard version done in time for the Party. Are you building or planning anything for this year's BK Party? "CQ BR" - The Bug Roundup! It's time to dust-off that precious old Vibroplex, or any other type of bug, and give it a work out! The W6FSM Bug Roundup will take place on Saturday, November 15th at 1800Z through 0600Z on the 16th (10:00 AM to 10:00 PM Pacific Time)...a full 12 hours of old-time CW delight. 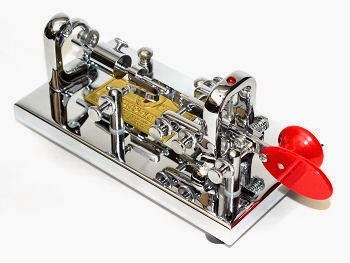 Sponsoring the event is the Samuel F. Morse Amateur Radio Club (W6SFM) of Sacramento, CA. Detailed information may be found at their website, located here. "a special time to bring bug operators together on the air. 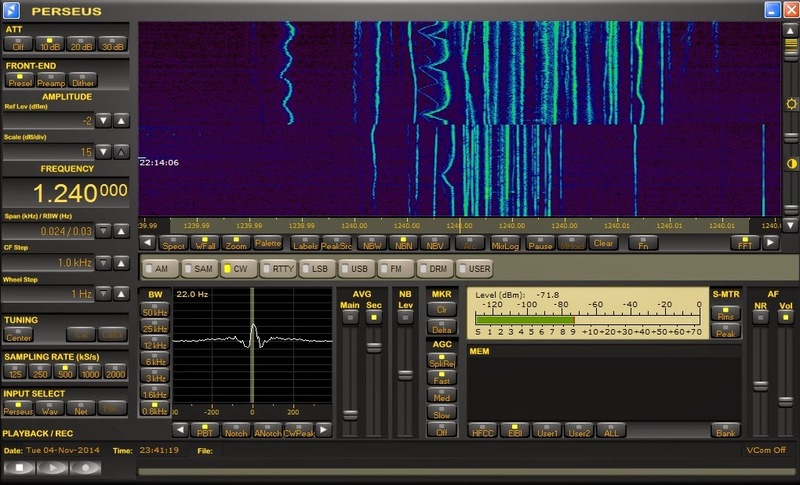 In the same spirit as ARRL's Straight Key Night, participants are encouraged to make simple, conversational, “chewing-the-fat” QSOs using their bug type key. This is an opportunity to exercise, share and exhibit your personalized fist. This is NOT a contest. Call "CQ BR" so folks know you are a Bug Roundup Participant." 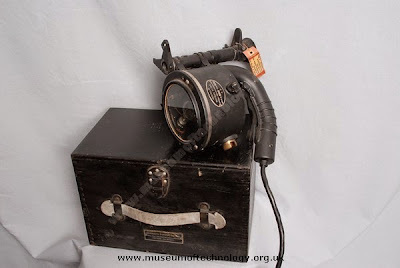 As it turned out, I was the only one in the group that stuck it out long enough to learn any code and was thusly appointed the 'chief operator' of the lamp. Unfortunately, learning the code visually with flashcards, made it even harder to later learn CW by sound as, for many months, I had to convert the sound of the CW back to the picture of it in my head, before identifying the letter...thankfully my brain was still empty enough at the time, that I was able to overcome the unintended curve-ball. 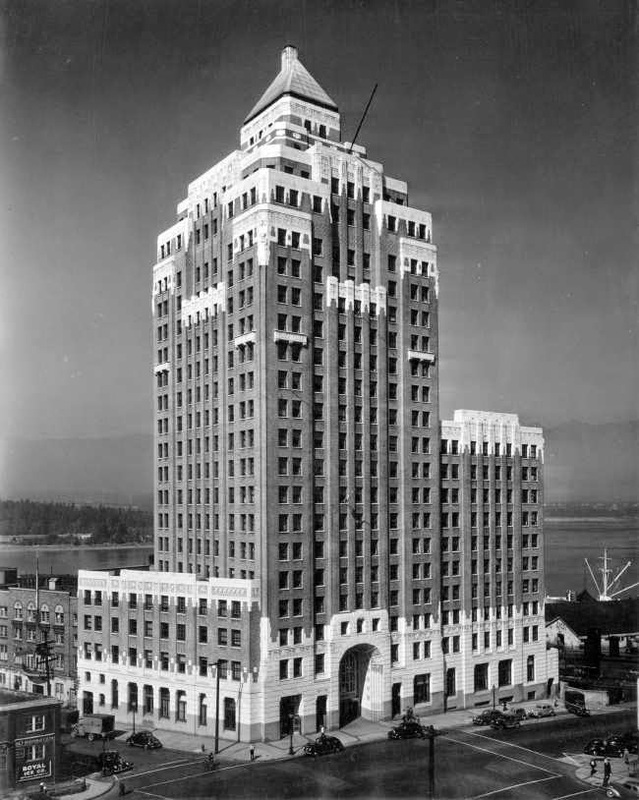 Our leader worked in the Marine Building, the tallest building at the time, in downtown Vancouver. The extra sets were distrubuted to several of the other local troops and numerous evenings were spent, at the very top of the building, working all of the other stations. It was usually cold and windy and most of the guys just wanted to go home but I loved it and could have stayed all night....it seems that there was little hope for me, even at that age! When it came to CW I was hooked and even today, almost 100% of my operating is on CW. It nice to see events like this and the ARRL's "Straight Key Night" along with clubs like the, "SKCC" , "FISTS", "FOC" and "The CW Operators' Club", all doing their best to keep CW alive. Hopefully you will have some time to play in the 'BR' this weekend. A few days ago I received an email from Jack (VA7JX) letting me know that his "U3"project was now complete. You may recall Jack's helpful list of tips regarding the use of SMT components and correct soldering techniques in an earlier blog....well worth a read if you are contemplating a start in SMT construction. "the third version in the "Ultimate" QRSS/WSPR kit trilogy. It can produce QRSS, Hell, WSPR, Opera and PI4 slow-signal modes anywhere from audio to 10m and above. Plug-in LPF filters are available for all 12 HF/MF/LF bands." 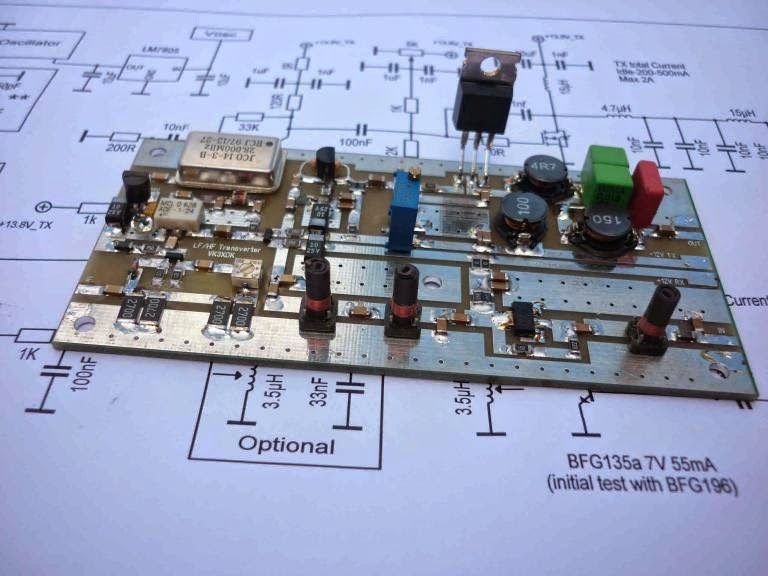 Jack has tailored his version for our new (to Canadian amateurs) 630m band but has also added a versatile MOSFET linear amplifier of his own design that runs on 12VDC. Using an inexpensive IRF540 switching FET, Jack can run up to 30W of output on 630m but normally runs at the 5-10W level on 475 kHz. Most of Jack's homebrew gear looks as if it just came off the Hewlett-Packard assembly line and his latest project is no exception. WH2XCR (Hawaii) at 4258 km. WH2XHY, 2822 km, Fitchborg Wi. WG2XXM, 2789 km, Wichita Kansas. N6KOG, 1390 km, Tracy Ca. KK6EEW, 1284 km, Healdsburg Ca. W7MY, 605 km, Richland WA. VA7JX is one of the three west coast Canadian stations that have transmit-capability on 630m, the two others being myself and VE7BDQ (John). John can be found most nights on the 475kHz WSPR mode as well, running the legal limit of 5W EIRP into a small inverted "L" as well. John has also enjoyed good success on WSPR, having been spotted regularly on the east coast and more recently, in Hawaii. For exact frequencies of both stations, check the WSPRNet Activity page for the latest real-time information. Although WSPR works well as a propagation indicator....and it seems that there is plenty of nice propagation on 630m....it does not allow two stations to actually QSO each other. Our new band really needs more Canadian stations to spark activity and get things rolling! Ideally, it would be nice to call CQ on the band, with a realistic hope of getting a reply. With three VE7's now 'all-ears', nightly activity from VE6, VE5, VE4 and VE3 would be an exciting prospect and would really liven-up what seems to be a very prop-friendly part of the spectrum...who'd a thought it? It seems that amateurs are now re-discovering what the maritime operators have known for decades! If any of us can help you with getting on-the-air, please do not hesitate to ask....and, if you are presently building or testing, you can look for your signal on the VA7JX 630m screen grabber....a real-time view of the band from VE7 land and available any time, by chance or by request, from VA7JX. I'm not sure exactly what went wrong but I hope that beautiful machine was not damaged too heavily. I've seen a few others using inexpensive quadcopters to get light strings up and over trees and it seems that they would be ideal for such tasks. As these devices flood the hobby-market, their prices seem to be dropping quickly and more and more amateurs are looking at these with antennas in mind. Over the years I have tried numerous methods of getting a string up and over...slingshots, fishing rods... but nothing seemed to get me past the 35'- 40' mark, if that high. Maybe it was just poor technique on my part as others claim to have good success with these methods. Eventually I decided to try a homebrew 'spud gun' as I needed to get wires up to the top of my 70' Balsam. I used Schedule 40 ABS pipe, the thick-walled stuff. This is becoming harder to find in the typical hardware outlets as most of it seems to be the lighter foam-core material which should not be used for this. When I first fired it, I wrapped the breech in several layers of towelling, just in case it blew apart but felt confident enough to remove it after a few test shots. 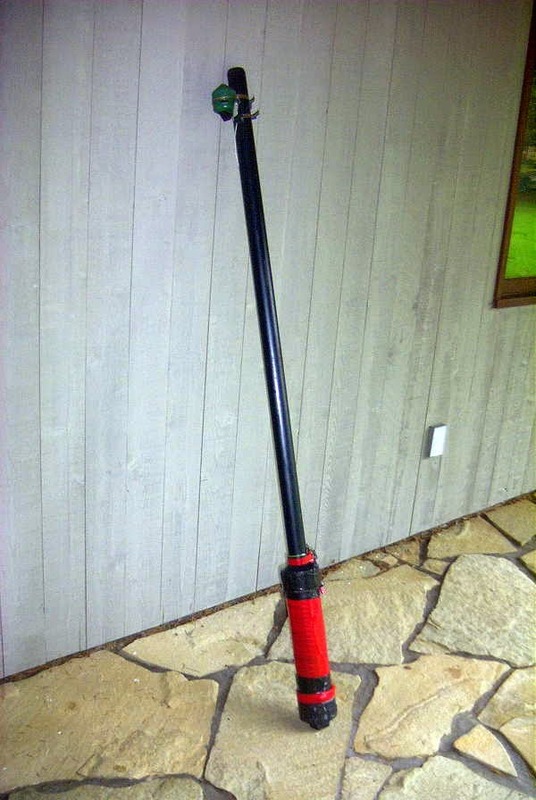 There are several websites describing spud gun construction and a quick Google-search will bring up some interesting plans. My system pretty much follows this design, found here at spudgunner.com. The first propellant that I used was hair spray but found that it quickly built-up a layer of sticky-goo on the inside of the cleanout cap and threads, making it very hard to unscrew the cap. I cleaned it thoroughly and changed to Right Guard spray deodorant which worked extremely well, was very clean burning and left no residue. The first few times I fired the gun I was shocked to hear how loud it was, with a loud 'BOOM' reverberating around the neighbourhood. After a few shots, I fully expected to see the local RCMP arriving but when enquiring a few doors away, I was told that they had not heard anything! Perhaps it is because the thing is right beside you at the time that makes it sound so loud but I have never had any enquiries about it. I have mounted an inexpensive (Walmart) spinning reel at the very top which has been loaded with a light (10lb) mono filament fishing line. 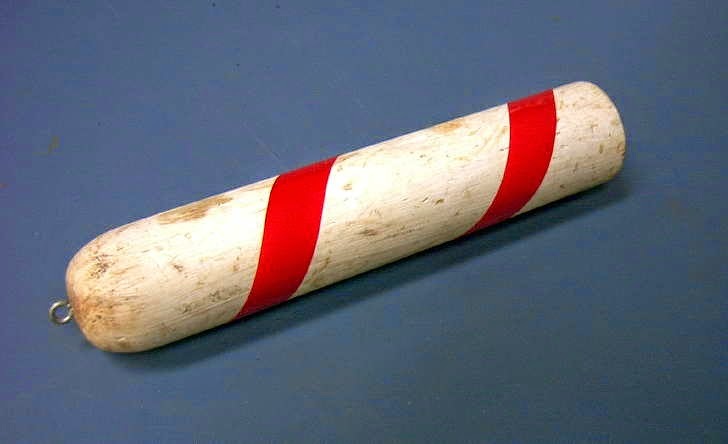 This is attached to a homebrew lathe-turned wooden bullet, about 8" long, as shown below. 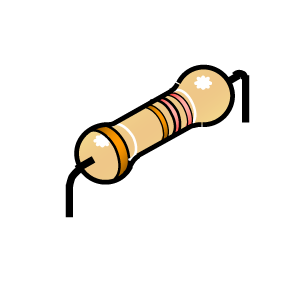 The bullet is lowered down the barrel to a peg mounted just above the firing-chamber. Once fired, it pulls line off of the spinning reel, hopefully to land on the ground on the other side of the tree. The initial attempt at launching the line over my 70' Balsam resulted in a perfect shot, but about 100' above the tree! The bullet pulled all of the line from the reel and snapped off. I eventually found it on the beach in a small bay about four properties to my south...oops. I then backed-off on the amount of propellant and found that just a short one-second squirt was enough for a more controlled launch. It took me a few shots to get the feel of the launcher and compensating for the light wind. It is best to do this when there is no wind at all is it doesn't take much to blow the line and bullet slightly off course. I have since used the gun many times, both here and at other ham's locations, to fire lines very high. It has always worked very well. Should you choose to build something similar, be sure to build with caution and follow any safety instructions noted on the various websites. Most importantly, be sure to use the proper material. I suspect that, overall, very few hams actually take the time to read ham radio blogs. Of those that do, there is probably only a small percentage that take the time to read any post-blog 'comments' that might be made by others....so...if you missed the comments regarding my recent e-Bay resistor purchase, the following information may be of interest. Steve, G1KQH, commented that he had found an even better deal on resistors from China at Banggood, in Guangzhou. I have heard good things about this company, which sells a large variety of items from electronic parts to the latest quadcopters. Steve reported a good buy on 1%, 1/4W resistors...50 different values and 50 of each....2500 resistors in total. The offering may be found here. Steve adds: "The values of resistor are: 10M ,4,7M, 2M, 1M, 390K, 330K, 300K, 220K, 200K, 180K, 150K, 100K, 82K, 68K, 47K, 33K, 37K, 20K, 18K, 15K, 10K, 9K1, 8K2, 6K8, 5K6, 4K3, 3K9, 3K3, 3K, 2K7, 2K4, 2K, 1K5, 1K2, 1K, 680R, 470R, 300R, 270R, 180R, 91R, 68R, 56R, 47R, 20R, 10R, 6,6R, 1,8R, 1,2R , 1R. 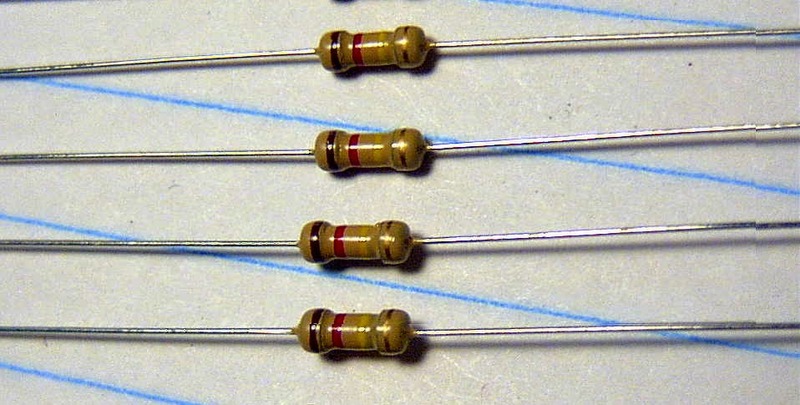 They are five banded resistors inc one for the tolerance. Arrived quick and you can use Paypal on Banggood, so no problem getting your money back if things go wrong." With the free shipping, this is a super price and could be very difficult to beat! In addition, they offer smaller 1/4W resistor kits, a nice kit of 1/2W resistors, SMD kits and capacitor kits. G1KQH maintains an interesting amateur radio blog, well worth a read. Thanks for the info Steve. It's always interesting to use one of the many 'audio viewing' software programs, such as 'Argo', 'Spectran' or Spectrum Lab, driven with receiver audio, to dig deep into a section of the spectrum using very narrow bandwidths. The narrower the bandwidth becomes, the greater the signal-to-noise ratio, increasing sensitivity in effect. The use of digital signal processing software can create the extremely narrow milliHertz filtering needed to view signals buried deep in the noise...the deeper the search (20db, 30db or more into the noise), the longer the time needed to build up the visual display of signals that would be far too weak to detect aurally. Recently, rather than using Argo to view a slice of spectrum I set up the Perseus waterfall display to have a deep-look at 1240kHz. This is one of the broadcast-band's 'local' channels and one that BCB DXers refer to as a 'graveyard channel'. Almost all stations on the various graveyard frequencies run a maximum of 1kW day and night. According to the Medium Wave List, there are presently 166 stations in North America operating on 1240kHz...one of the reasons that 'DXing the graveyards' is so interesting. With this in mind, I recently took a mid-afternoon listen. Just one station was audible to my ear, likely one of the stations to my south in Washington state. Centering Perseus on 1240kHz, the waterfall was set to display a ~50Hz slice of the spectrum...1240kHz +/- 25Hz. The screen below shows the display, ranging from 1239.976kHz to 1240.024kHz. After letting the waterfall visual display slowly build up, it revealed 26 separate carriers. The remaining signals, although propagating to my location, were too weak to be detected aurally. Checking the MWList once again, it shows only 11 stations to be within expected daylight groundwave distance from here...Washington, Oregon and B.C. Evidently there is some mid-afternoon skywave involved or I am seeing some extended groundwave from Idaho, Montana and California. MW List shows a total of 27 possible candidates, assuming extended groundwave, so it would seem that most of them are making it here in daylight. Next I switched to an even narrower filter, at twice the previous resolution, visible on the top-half of the waterfall above. This displayed a ~25Hz spectrum slice, still centered on 1240kHz. Although finer resolution is evident, there appears to be no additional signals except for the three new arrivals slowly fading in at the right as sunset creeps closer. The screen above was made approximately one hour after sunset (looping E-W) and shows the same 25Hz slice centered on 1240kHz. There are ~70 carriers visible by now, with most of them fading. Some transmitters appear to be rock-solid while most exhibit a cyclical drift, no doubt the result of some form of crystal temperature stability attempt. I'm guessing that the rock-solid ones are using more modern synthesizers for frequency generation. Listening on 1240 during this period reveals a boiling cauldron of audio, mostly unreadable until one station fades-up and becomes intelligible for a short period before fading to be replaced by another. Sitting on this frequency at the top-of-hour identification time can often catch a few idents with careful listening. 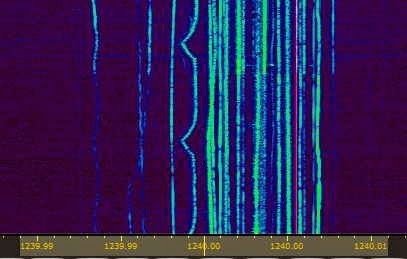 Even comparatively empty 540kHz reveals 22 different carriers, the only audible one being CBK in Watrous, Saskatchewan, the brighter trace at 540.002kHz. The one at the right looks as if it may have just come on the air for the evening. It's possible that many of these are low powered traffic information stations (TIS) running at 10 watts. Friday evening's 630m crossband activity was 'interesting' in many respects. Propagation, which had been improving slowly, chose to follow Murphy's Law. The K-index, holding at a quiet '1', rose to level '3' by the time our event had concluded, as the geomagnetic activity ramped up. Additionally, lightning pocketed various areas of the continent, making listening noisy for many. More than one of the DX contacts mentioned using just their HF dipole for listening to my signals on 630m and simply 'A-B' switching their transceiver's frequency while two of those sending 'heard' reports were using 100' longwires. 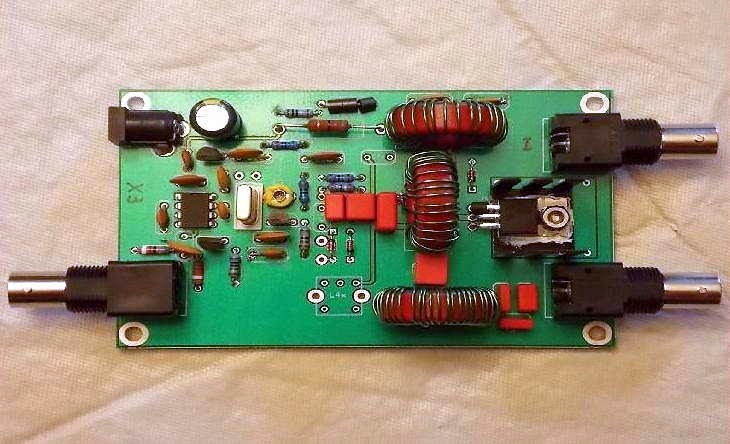 Mike Tuggle (WY3B) in Hawaii was using his amazing 1-MOSFET regen and small inverted 'L' ! I was also more than excited to exchange signal reports with Pennsylvania and Texas. 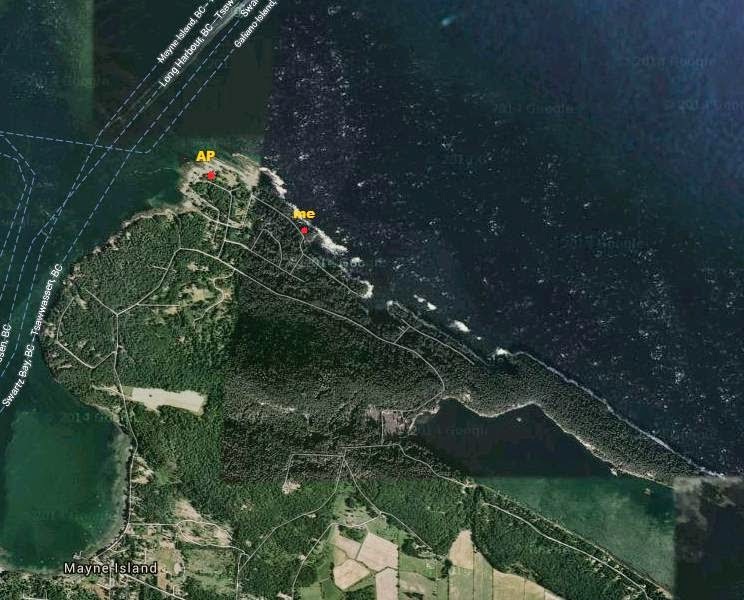 Considering conditions, this distance was far beyond my expectation but both of these stations have very efficient, dedicated 630m antenna systems. It was gratifying to see all of these fellows making the effort to listen for our signals or to attempt the QSO. This exercise taught me a few things about our new band. It is not necessary to have huge antennas and acreage to make this band work. 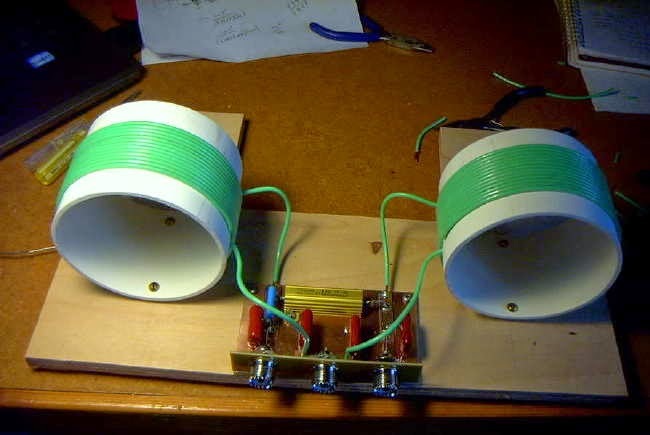 Good solid contacts can be easily made with small backyard antenna systems. With good systems on both ends, transcontinental QSO's can be made. 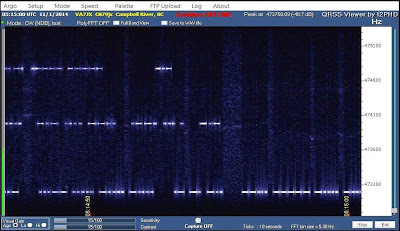 There really should be more interest by Canadian amateurs in their newest band as so much work has been put into securing this portion of the spectrum as a ham band. It was very disappointing not to work any stations in VE6, VE4 or VE3 land. There is already much interest in this band by U.S. amateurs, many of them anxiously awaiting the day that they can also call it a ham band. I would like very much to continue this type of crossband activity to try and generate more interest in our new band. I'm presently considering a weekly, one-night crossband operation, similar to Friday's event, perhaps running for one hour per week. The main difficulty will be in getting the word out to those that might wish to participate. During the past few projects I'd noticed a serious diminishing of my 1/4 watt resistor stock and decided to see what was available from e-Bay. Many of the dealers in China were offering various packages at reasonable prices and it is hard to resist 'free shipping'. After narrowing things down I decided on one particular dealer, electronics-salon, who had only five minor complaints in over 17,000 transactions during the past 12 month period. As well, he seemed to be selling only high-quality components, unlike many of the sellers from China. 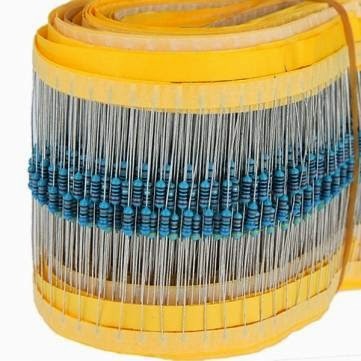 0 to 10M ohm 1/4 Watts Axial Lead Carbon Film Resistors Assorted Kit. E-12 Series 86 Values, Total 860 Pieces (Each 10). With free-shipping, the cost was just over one-cent per resistor and would nicely re-stock my 1/4W trays as well as provide me with many more values to choose from than at present...hard to resist! 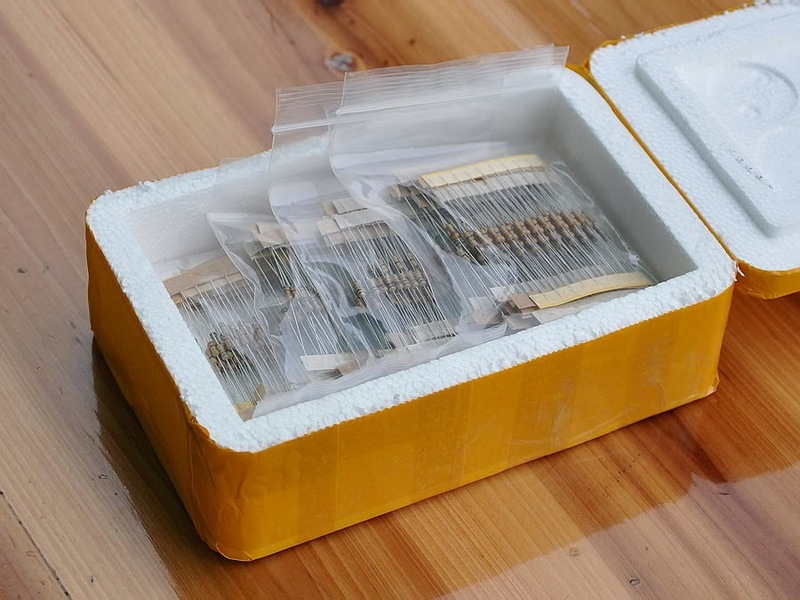 The resistors arrived, packaged as shown, at the normal 'free-shipping' (slow) rate, which I don't mind. I selected three values to test and three samples of each value...120K, 68K and 8.2 ohms. All resistors were within their 5% tolerance rating except for one of the 8.2's which measured 7.6 ohms... 2% out of tolerance. I next smoke-tested a 680 ohm resistor for five minutes at slightly more than 1/4 watt dissipation. Measuring the resistor immediately after revealed that there had been no change in resistance. Overall I am pleased with this purchase and would buy from this particular e-Bay seller in the future.